This live boot camp will provide insights on how a food facility can comply with the FDA’s laws and regulations for a successful FDA inspection. Every year, millions of Americans get sick—and some even die—because of foodborne diseases, according to the Centers for Disease Control and Prevention. 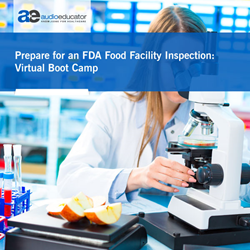 AudioEducator, a division of audio conference and corporate education leader ProEdTech, will host a live boot camp titled “Prepare for an FDA Food Facility Inspection: Virtual Boot Camp”, with regulatory compliance expert Angela Bazigos on Tuesday, June 19, 2018 at 12:00 pm ET. Every year, millions of Americans get sick—and some even die—because of foodborne diseases, according to the Centers for Disease Control and Prevention. And thanks to the Food Safety Modernization Act, the Food and Drug Administration (FDA) is out to curb this largely preventable problem. Food producers should therefore expect—and prepare for—scrutinizing FDA inspections. This 180-minute Virtual Boot Camp with regulatory compliance expert Angela Bazigos will explain food safety and the FDA’s inspection process in detail. Bazigos will cover the FDA’s oversight program and provide insights on how to comply with the agency’s laws and regulations. She’ll also provide instruction on what to do when problems emerge. Plus, she will provide an insider’s take on how to ace an FDA inspection by following the very checklist the agency uses to spot any deficiencies. Participants will understand the basics of food safety, the FDA inspection process, common problems areas, and special considerations for foreign facilities. They will learn how to prepare for an FDA inspection, handle any citations issued, and how to prevent future tickets from being written. This soup-to-nuts regulatory compliance boot camp will benefit all professionals in the food industry – such as FDA food inspectors, safety officers, microbiologists, and anyone in food manufacturing. For more information and to register, visit: https://www.audioeducator.com/virtualbootcamp/survive-an-fda-food-facility-inspection. Get $50 off on our conferences and webinars. Use Code PRWEB50 on checkout (applicable for all purchases). ProEdTech regularly provides professionals the opportunity to get answers to their most complex questions directly from experts, without having to attend costly live conferences. To learn more, visit: https://proedtech.com/.